Pre-heat the oven to 400 degrees Fahrenheit. Place the plantain in a baking dish lined with aluminum foil and make a couple of 1/2-inch slits on its skin. Bake until completely cooked through, about 40 minutes. Remove from the oven, when cool enough to handle, peel and slice. Set aside. Heat a comal, griddle or skillet over medium heat. Once hot, toast the ancho and guajillo chiles for about 30 to 45 seconds per side, until fragrant and lightly toasted. Place chiles in a saucepan along with the whole tomatoes, cover with water and set over medium-high heat. Simmer for 12 to 15 minutes, until the chiles are rehydrated and plumped up, and the tomatoes are cooked and mushy. On the same comal, griddle or skillet, char the unpeeled garlic cloves and the onion slice, until completely charred and softened, about 8 to 10 minutes, flipping a couple of times in between. Set aside to cool. Peel the garlic when cool enough to handle. On a small skillet set over medium heat, toast the cinnamon stick for a minute or two until fragrant, flipping once. Next, toast the cloves and peppercorns for a minute, moving them around the entire time. Toast the almonds for a couple of minutes, until lightly browned, as well as sesame seeds. Lastly, toast the oregano for 5 to 10 seconds. As each ingredient is finished being toasted, place it in the jar of the blender: the cinnamon, garlic, onion, cloves, peppercorns, almonds, sesame seeds, and oregano. Add the rehydrated chiles, cooked tomatoes and 1 cup of their cooking broth, and the plantain to the blender, as well. Incorporate the raisins, sugar and 1 teaspoon salt, and puree at least for a couple minutes until completely smooth. If your blender is on the smaller side, puree it in batches. Set a large casserole over medium-high heat and heat enough oil to have about 1/8-inch of depth. Season the chicken with the remaining teaspoon of salt. Once the oil is hot, brown the chicken pieces in batches, making sure to not crowd the casserole. Cook until they have created a crust on the skin and are easy to flip, about 3 minutes per side. Place the finished pieces in a large bowl. Once you are done browning the chicken, reduce the heat to medium-low. Carefully, and using the casserole’s lid as a shield (there will be splatters), pour the mole sauce into the oil. Stir and cover with the lid, leaving it slightly open, and cook for about 6-7 minutes, stirring occasionally (still protecting yourself with the lid), until the sauce is very thick and seasoned. Add the chicken broth, chocolate pieces, and the browned chicken pieces, and cook for another 20 minutes. Add the chayote squash and green beans, give it a good stir, and cook until vegetables are cooked yet tender, another 10 minutes. Serve with tortillas and/or rice. When I saw this on TV this made my mouth water, I am so excited to have this recipe. It is so hard to find authentic food in my area, all food comes in on a truck, no one, not one of the Mexican restaurants around here makes things authentic or fresh, its all the same stuff, tacos, enchiladas, burritos, just some limited. Mexican food is so MUCH more! Hope you love the chicken, Milagros! Hi Patti can you use any meat with this or just Chicken. Is there different types of mole sauces for different meats. Oh you can use your favorite type of meat. Hola Pati, saludos desde Mexicali, donde puedo encontrar tus recetas en español? I just made this for my husband (who is originally from Oaxaca) and I don’t think he has ever enjoyed anything I have made for him more! He was so proud he took some to his brother and friends. Now he’s asking if you will post a recipe for menudo! Super! This makes me so happy to hear Shonna. I’m so glad he enjoyed it so much. And I’ll try to post a menudo recipe soon. Hope its as delicious as my moms…love you mom😢. I hope you enjoy it Gloria. Can I used boneless chicken instead of bone in chicken? Making this tonight have potatoes ready in fridge . chocolate leche cake is done .Ingredients all measured and ready to start on mole and chicken so excited , my husband is also a critic and a wonderful cook so I giving this a try .. love watching your shows and seeing the place you visit. Oh I hope you and your husband love it! Buenos Dias Pati! I watched your show this early morning for my first time & saw you make this Coloradito chicken dish. I’ve always loved Mole from a Kid in Kansas watching mi Abuela & My Mom make it! Tambien me gusta con Costillas de Puerco como las preparaba mi Suegra en Houston! This weekend I will be prepping this Coloradito Chkn with a good friend of mine who loves Mole as much as I do. Please come to Texas & put on a Cooking Show. maybe I can find a friend of mine in Community Events to find you a Sponsor!! Un Abrazo Grande!! Wow! The best mole my family has ever had! The flavor was awesome, the chicken succulent and the vegetables perfection. I have learned to put my complete trust in Pati’s recipes. Thank goodness for the blender, did it in one batch. Definitely a keeper and another new receipt to add to menu. Thank you Pati! You are a god send! I made this for Sunday dinner last week. It is the best mole we have ever had. My husband is an excellent cook and a careful critic of what he eats. He love it! He said it was a surprising mole with such nuances of various flavors. In addition, I was on the fence about buying a powerful blender. This recipe convinced me to get a Vitamix blender. You need a powerful machine to puree the sauce. Yes, you can do it in batches, but it takes more time. Love Pati’s show, recipes and her! Oh you will love your blender…I know I couldn’t live without mine! Hi Pati – I am looking to change up my tamales (that I learned from you!). 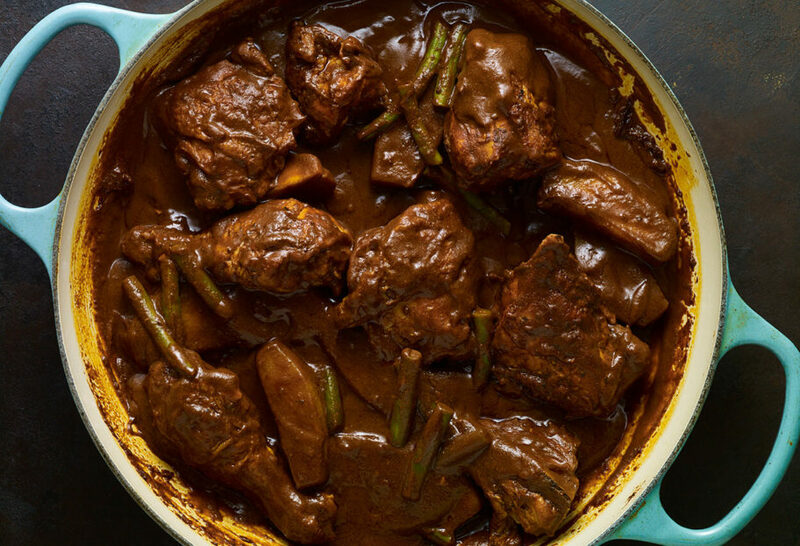 Could I use shredded chicken with this mole recipe and put it in a tamale casserole? Give it a try…and let me know how it goes!